M A Healy and Sons Ltd Wholesale has made a move to Unit 5 Knockenrahan Industrial Estate Arklow. This move consolodates our Wholesale business in order to service our country wide customers. Monday to Friday from 8.30 am to 5pm and Saturday 9 am to 2pm. Our new extended Trade counter Outlet will be open to all before Christmas 2016. Our existing Trade Counter the "Safety Shop" is business as usual. Check out our new range of GPS watches and rangefinders. Bushnell™ Laser Rangefinders have become the standard of excellene for Golf accessories. The top golfers of the world are using them - an ideal Christmas present or gift/prize. M.A Healy & Sons Ltd. now stock the Nytello Workwear Range. This range caters for Kitchens & Restaurants, Nursing & Healthcare, and Cleaning & Service Industries. Nytellos collection offers practical garments with many functional details. They are very careful in their choice of material and are strong believers that work wear should be comfortable, functional, and easy to care for while maintaining their high quality appearance. Nytellos products are available in sizes XS to 3XL both in classic or modern cuts and colors. Range of 3M Products now featuring on our website. Hard Floor Care Products, Safety Matting and Floor Pads have been added to our range. Deirdre Byrne presenting the M.A. 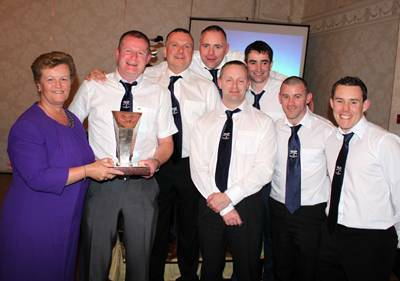 HEALY MINE RESCUE TROPHY to the winning Tara Boliden Team. Congratulations to everyone who participated in the competition - amazing work to promote mine safety; practice mine rescue skills; build team and personal confidence; promote comradeship between teams and develop mine rescue skills between Ireland and the UK. OUR LATEST NEW SUPPLIER - CLIMAX.s.a. M.A. Healy & Sons are delighted to introduce our latest new supplier CLIMAX.s.a. Climax is the leading Spanish manufacturer of Personal Protective Equipment (PPE). Dermot Healy & Conor Byrne of M.A. Healy & Sons recently underwent training in Barcelona in the use of Climax Fall Arrest devices and Safety Harnesses. With more than 25 years experience in the sector, Climax have become a benchmark in the world of Occupational Protection, both nationally and internationally. Present in more than 60 countries and offering one of the most complete PPE catalogues. All Climax PPE is designed and developed by our Technical Department before testing by the laboratories of the official authorities, certifying design and quality as well granting CE CERTIFICATION to the products. Exhaustive tests are performed on each piece of equipment, guaranteeing quality and compliance with technical requirements of CE regulations. Check out our range of Climax products today. Global leader in safety footwear, Rock Fall (UK) Ltd, brings unparalleled safety to Irish workers after partnering with premier Irish distributor or personal protective equipment, M.A. Healy and Sons. Having established itself as a global name at the forefront of safety clothing and protective footwear, Derbyshire, UK-based Rock Fall (UK) Ltd built its name through developing innovative products that combine comfort, value and providing safety exceeding many national standards. Amongst their extensive range that boasts a choice of boots for all industries and environments, their Roc-Met range of safety footwear was the first in the world to feature, not only toecap protection, but also metatarsal protection exceeding European S3 safety standards. In addition, the boots now feature anti-abrasion resistant thread, making them one of the most rugged, safest work boots on the market. Established in 1971, M.A. Healy and Sons distributes over 8,000 personal protective equipment products throughout Ireland, including respiratory protection, head protection, hearing protection and of course, protective safety footwear. The partnership with Rock Fall (UK) Ltd means that this already established market leader will be providing an even broader choice to it's customers and safety boots that lead on innovation for uncompromised safety. Rock Fall (UK) Ltd Sales Director, Richard Noon explains his company's choice of distributor for the Irish market: "Rock Fall has supplied the Irish market for a number of years now. With a demand, particularly amongst the mining and quarrying industries for a very rugged boot that protects the entire foot, we forged a relationship with M.A. Healy and Sons based on a very impressive track record to take our Roc-Met boot, along with all other Rock Fall ranges, effectively to the Irish market". Mr Noon added; "M.A Healy and Sons will enable Irish customers to source some of the best boots in the world directly from Ireland, with the added satisfaction of local customer support and shipping and at very competitive pricing". Rock Fall (UK) Ltd's Roc-Met boots are the product of extensive research and development resulting in a number of patented components that form the world's first metatarsal protective boot to exceed S3 European safety standards. The lightweight, flexible inner plate protects the wearer's fragile metatarsal bones from impact, whilst toecap and mid-sole protectors defend the rest of the foot. Aesthetically fashioned in full grain leather, with rubber outsoles designed to withstand heat up to 300 degrees Celcius and now bonded with super hard-wearing anti-abrasion stitching, Rock Fall's unique 'Activ-step' foot-bed ensures complete comfort for the wearer. With a number of equally innovative products expected to be introduced to its already comprehensive range of safety footwear, Rock Fall (UK) Ltd is confident that the Irish market will have unparalleled access to some of the best safety footwear in the World, thanks to M.A Healy and Sons. Rock Fall UK Ltd has become a leading name for high quality safety footwear and clothing. The success of the Rock Fall brand is owed to its ability for safety products to be, not only functional, but also fashionable. The company strives to meet the needs of its customers and suppliers by offering extremely competitively priced products that are always delivered on time. As well as promoting its own brands, including: 'Tomcat', 'ProMan' and a ladies safety footwear range called 'Vixen', Rock Fall (UK) Ltd also designs and develops bespoke branded work wear. With over 27 years experience in the safety footwear industry, Rock Fall (UK) Ltd has established an excellent reputation in providing a professional and innovative service to a wide range of industries. Lil calls it a day after 36 years, pictured here on her last day October 4th, 2013 with M A Healy between them over 100 years of service with M A Healy & Sons ltd. All the staff at M A Healy's really miss Lil but we wish her a very happy retirement and hope herself and Paddy have many great holidays ahead. Thanks Lil for everything.